A graphic in the Federal Railroad Administration (FRA) Record of Decision (ROD) for NEC FUTURE, released Wednesday. NORWALK, Conn. – Federal plans to expand rail service in the Northeast corridor continue to include additional high speed track through Norwalk. 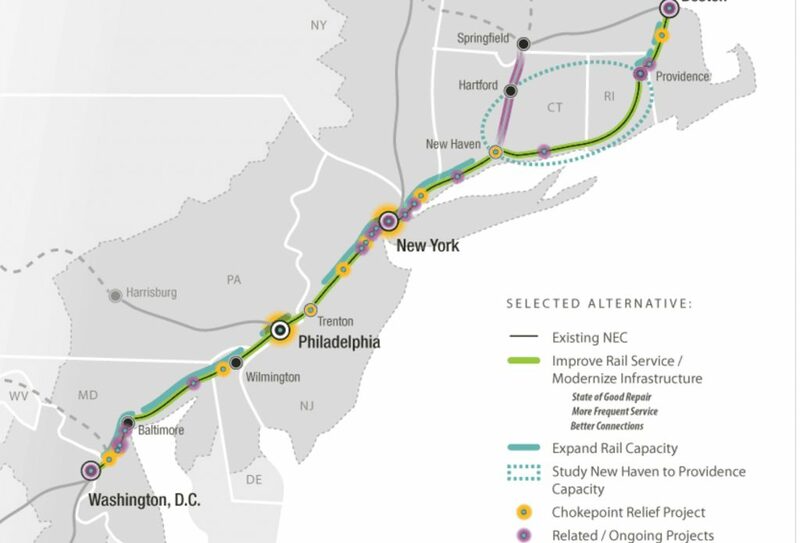 The Federal Railroad Administration (FRA) on Wednesday released its Record of Decision (ROD) for NEC FUTURE, its comprehensive plan for improvements to the Northeast Corridor rail line from Washington, D.C., to Boston, Mass., after months of public input. This includes adding tracks through Norwalk, although no specifics are offered. Tier 2 major capital projects, such as additional high speed rail through Norwalk, “may not occur for decades,” according to the NEC Future website. “The NEC railroads and Northeast states, along with the NEC Commission, will play leading roles in determining how and when the various Tier 2 projects move forward,” the website states. “Governor Dannel P. Malloy today is commending the Federal Railroad Administration’s (FRA) decision on the NEC Future program for responding to his consistent urging to focus on upgrading and maintaining the Northeast Corridor (NEC) in a ‘state of good repair’ and postponing consideration of any new alignment of the tracks through Connecticut. “Improve Rail Service: Corridor-wide service and performance objectives for frequency, travel time, design speed, and passenger convenience. “Modernize NEC Infrastructure: Corridor-wide repair, replacement, and rehabilitation of the existing NEC to bring the corridor into a state of good repair and increase reliability. “Expand Rail Capacity: Additional infrastructure between Washington, D.C., and New Haven, CT, and between Providence, RI, and Boston, MA, as needed to achieve the service and performance objectives, including investments that add capacity, increase speeds, and eliminate chokepoints. The ROD is part of a legally mandated process, in accordance with the National Environmental Policy Act of 1969 (NEPA) and subsequent updates. “The Preferred Alternative for the portions of the NEC between Washington, D.C., and New Haven, CT, and between Providence, RI, and Boston, MA…. includes more than 200 route miles of additional track capacity, creating a four- to six- track NEC, and the replacement and expansion of the bridges and tunnels as required to support the service frequency and travel time objectives,” the ROD states. Norwalk state legislators were not immediately available for comment. “Connecticut continues to make substantial investments in the Northeast Corridor. In the first annual report of the Northeast Corridor Commission, which details investments in the corridor during 2016, the state spent $367 million of the total $1.1 billion spent on the entire network from Boston to Washington, fully one-third of the total investment in this vital rail corridor.